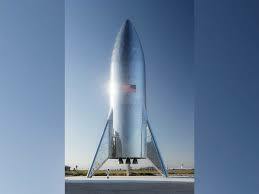 SpaceX is readying their ‘Starship Hopper’ spacecraft prototype for its first test. The prototype, a small version of the huge, 100-passenger Starship now in development, could undergo its first test soon, SpaceX CEO Elon Musk tweeted on March 17. The uncrewed vehicle, called Starship Hopper, is expected to take brief “hops” during the test, lifting off “only barely,” according to Musk.For more, check out this NBC News story.